Spektre MET-RO 2 - Gold / Havana Caffe Latte w/ Blue Mirror Need Help? Ultra contemporary, yet timelessly chic, Spektre's MET-RO 2 compliments almost anyone who puts them on (woman or man). Coming in at just 20 grams, they boast feather lightweight metal and acetate construction, providing all day comfort. Other distinctive features include rounded lenses encased in acetate connected by its signature arching wire bridge. 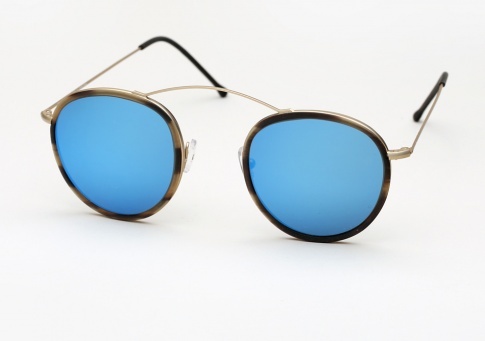 It is offered here in "Havana Caffe Latte" acetate with gold metal, paired with blue mirror lenses.